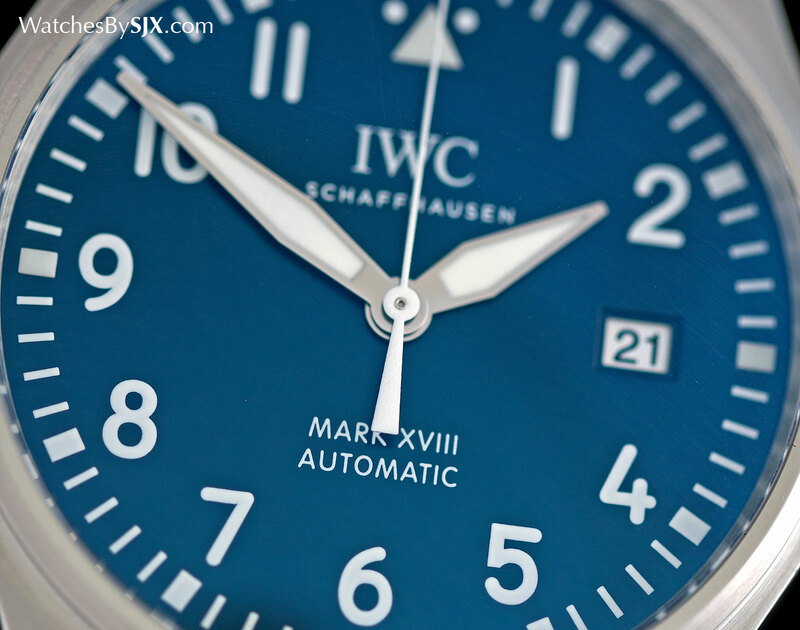 How Good is the Mark XVIII – IWC’s Entry Level Pilot’s Watch? 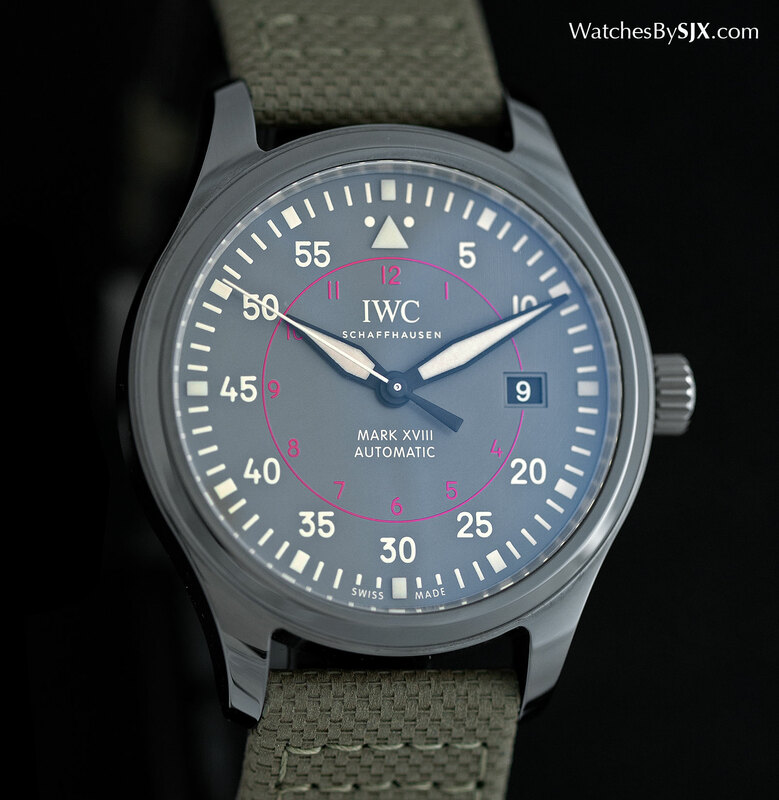 Introduced at SIHH 2016, the Mark XVIII is most affordable watch in the Pilot's Watch line-up from IWC, the newest instalment in a long line of bestselling, time-only aviator's watches. 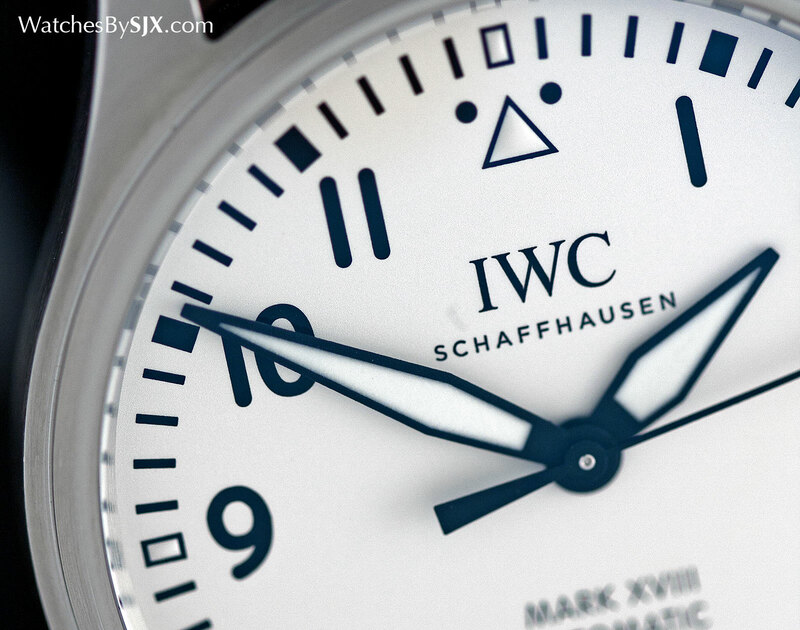 The IWC Mark XVIII is the aggressively priced, entry-level watch in the new Pilot’s Watch collection launched at SIHH 2016 endowed with the right qualities. With a palatable design, aviation heritage and affordable price, the Mark XVIII will probably sell well. But how good is it actually? 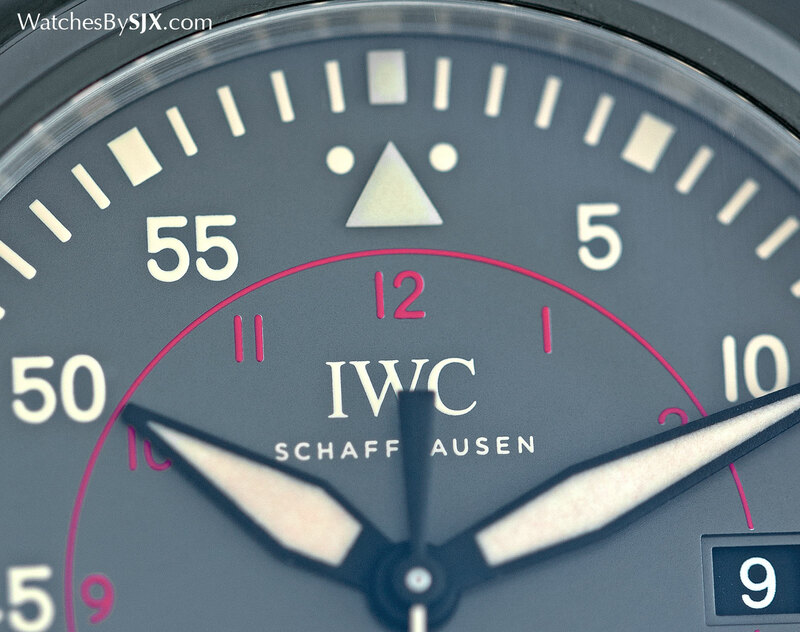 Back in the 1930s IWC was began making aviator’s wristwatches of the type that’s familiar today, with a black dial featuring large Arabic numerals. 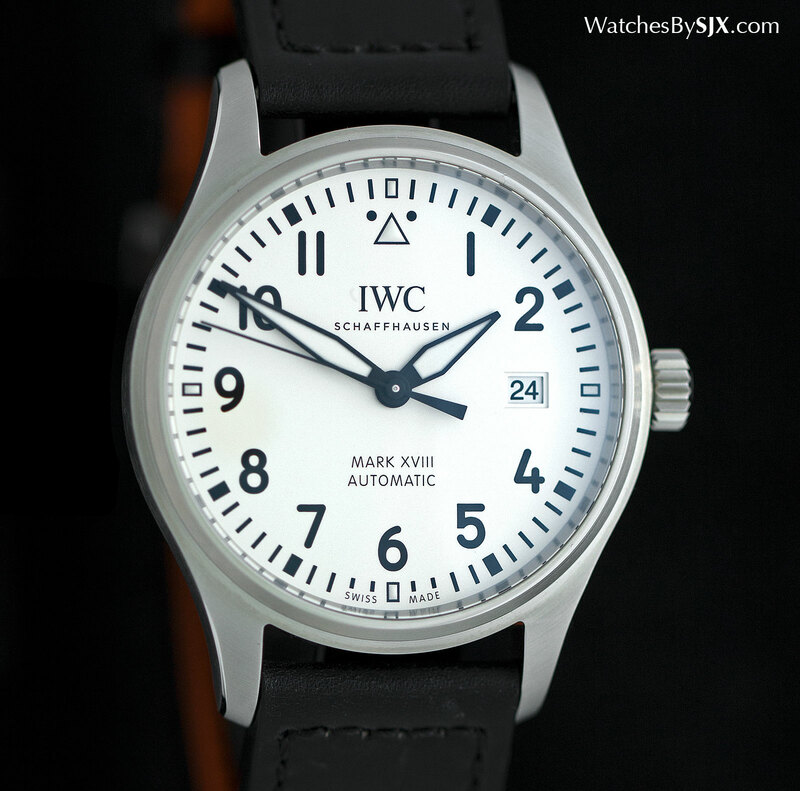 Nicknamed that Mark IX, that was succeeded by a successive pilot’s watches, culminating with the famed Mark XI of the 1950s. Fast forward to the 1990s and the idea was revived with the Mark XII, a watch that laid the foundations of the modern IWC pilot’s watch. Three generations later (the Mark XII made way for the Mark XV, XVI, and XVII), the Mark XVIII – the Roman numerals mean “18” – has arrived. 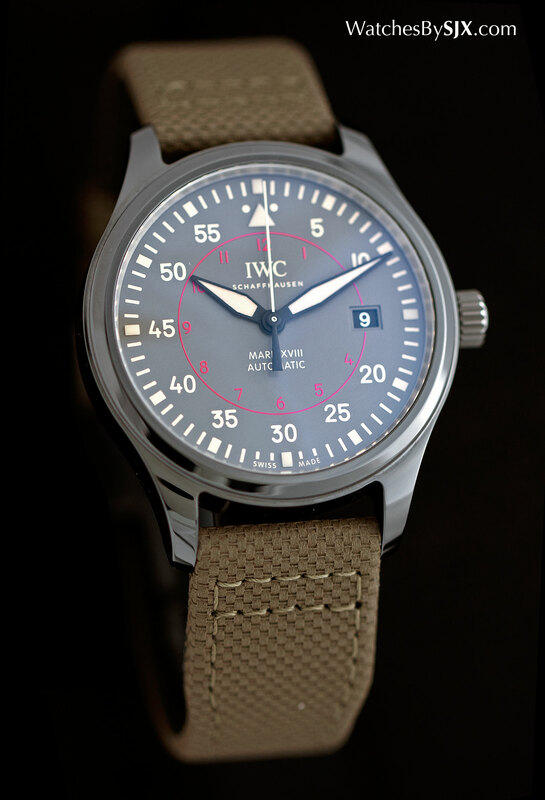 All the elements that made earlier versions of the basic pilot’s watch have been retained and even revived. Best of all, the Mark XVIII costs almost a quarter, or US$1000, less than the model it replaces. The look of the Mark XVIII is similar to that of the Mark XVII, but sticks to the basics instead of trying too hard. Whereas the previous model attempted to mimic the look of a cockpit instrument with a triple-date aperture and missing “9”, the Mark XVIII goes back to a more traditional look. It’s not novel at all, but it works. At 40 mm in diameter the Mark XVIII is not too small and not too large; it is just right. The narrow bezel makes it seem larger than it is, which suits the aviation look. And it’s 11 mm high, giving relatively elegant proportions with a high diameter-to-thickness ratio. 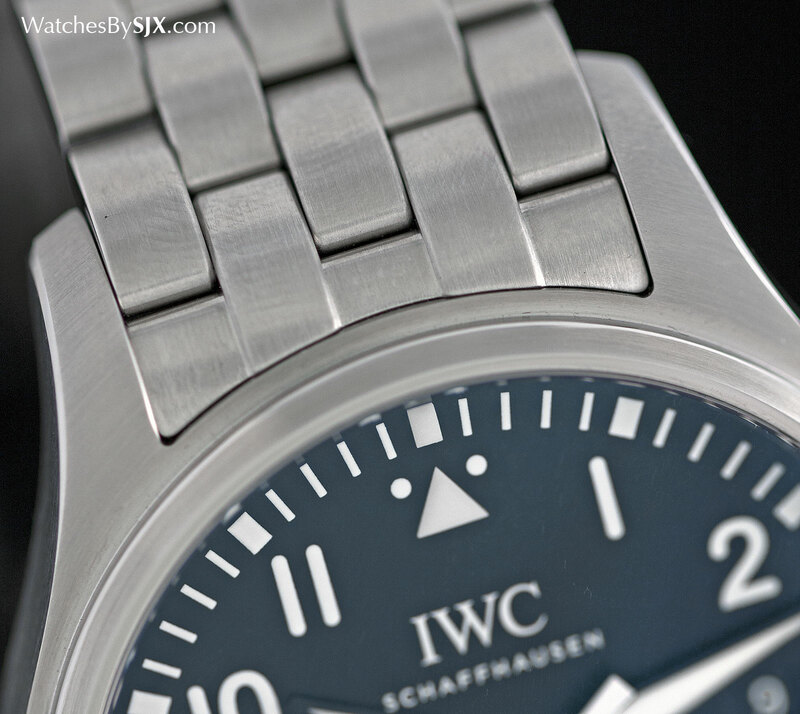 Like most IWC watch cases that of the Mark XVIII is solidly made. It’s brushed on all surfaces, except for a pleasing, narrow bevel that runs along its length. As far as watches in this price range go, the Mark XVIII case rates better than most. And it has a soft-iron cage inside to protect the movement from magnetism, a traditional feature of pilot’s watches that reassuring to have, though decidedly low-tech in the age of 15,000 Gauss Omegas. 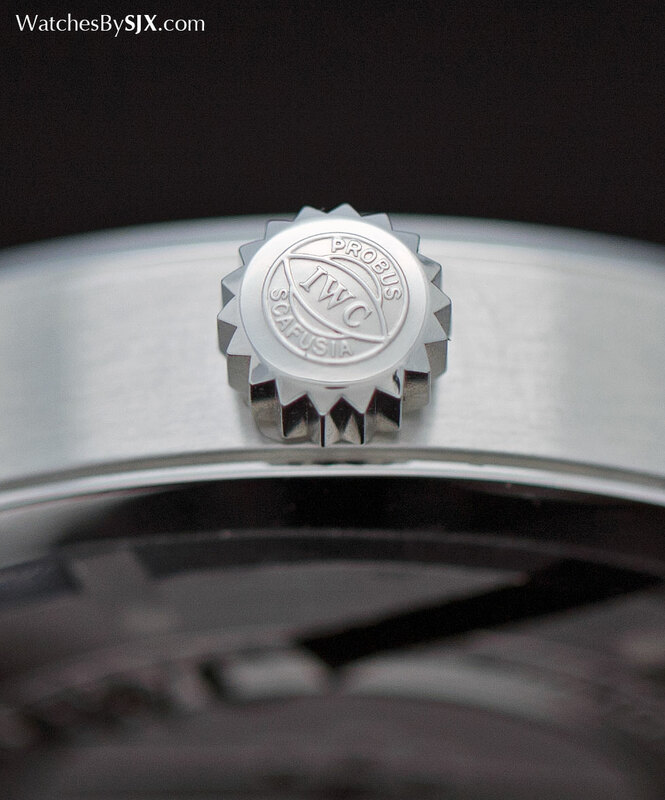 While pricier IWC watches are powered by impressively engineered in-house movements, the Mark XVIII is equipped with the calibre 30110, which is actually the ETA 2892. Low-cost but reliable, the ETA 2892 and has a two day power reserve, as well as a date function. It’s not much to look at, but is eminently functional and par for the course. Movements of this class are pervasive in this price range. If there’s one shortcoming it’s proportions: because the movement is relatively small, the date sits oddly far from the edge of the dial, looking stranded. However, disembodied date windows like this are nowadays inevitable enough that it isn’t much of a deal anymore. 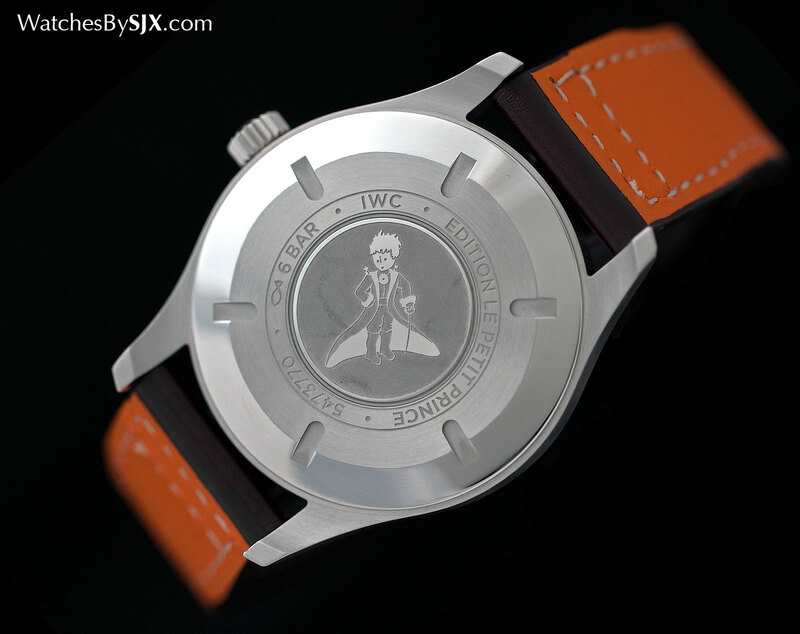 Unusually the basic steel Mark XVIII is available with a black or white dial. 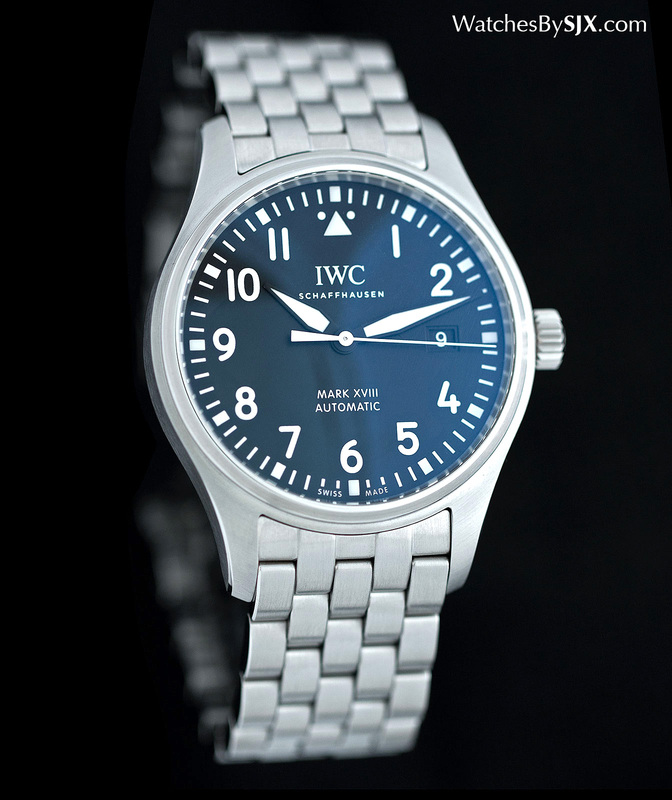 Not since the Mark XV has IWC offered its basic pilot’s watch with a light-coloured dial. That’s a good thing, however, because the white dial is striking and different from the crowd of pilot’s watches that tend to look the same. Priced the same but ostensibly a “special” edition – which will displease those who bought the similar limited edition in 2013 – is the Mark XVIII “Le Petit Prince”. This has a metallic blue dial that’s a hallmark of the series dedicated to the novel by French author and pilot Antoine de Saint Exupéry. Along with the white Mark XVIII, this is the best looking of the lot, and it costs exactly the same as the black or white models. 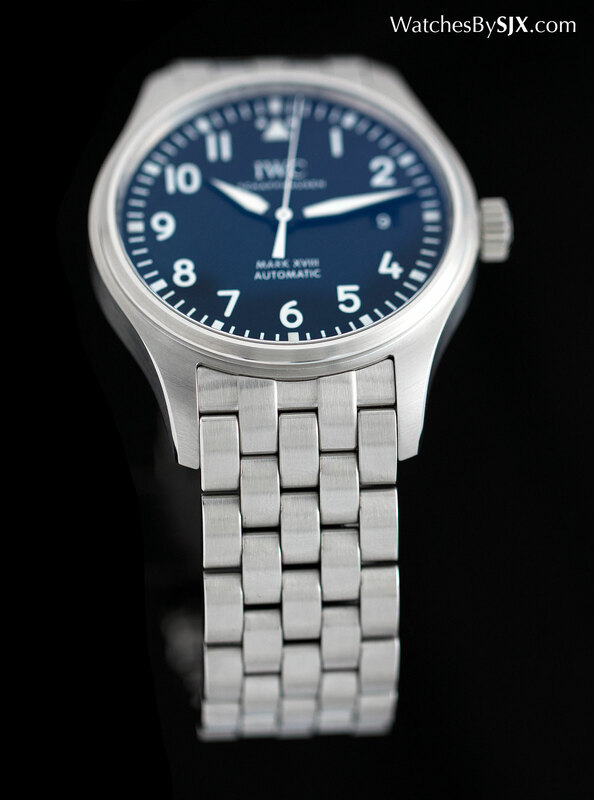 The dial is a deep, relaxing blue with stark white markings, while the case back has an engraving of the Little Prince himself. Named after a Marine Corps base in San Diego, the Mark XVIII Top Gun Miramar costs more but is lacking. A little larger at 41 mm in diameter, it nonetheless seems smaller because of the dark grey ceramic case. Smooth and glossy, the ceramic case looks inexpensive. 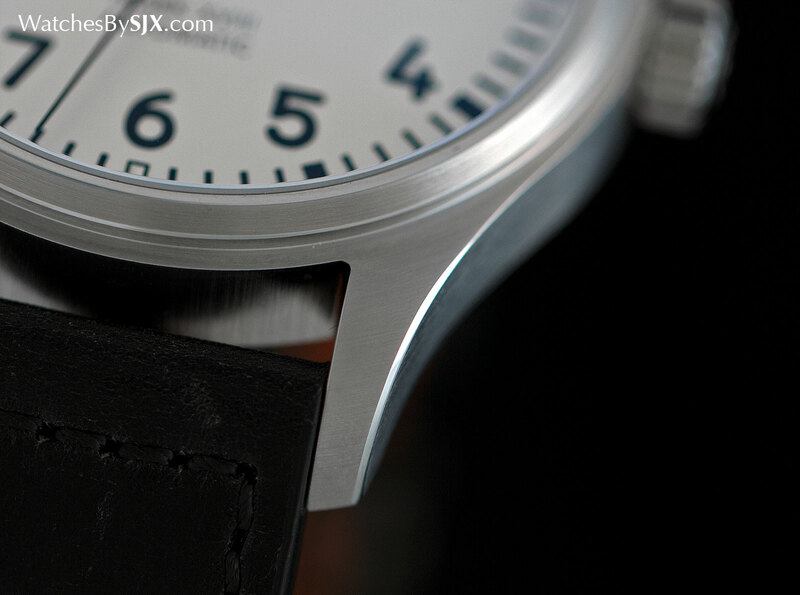 The basic Mark XVIII is stainless steel, available with the choice of a steel bracelet or leather strap. The bracelet feels solid, with five links across that give it suppleness, but the detailing of the bracelet, especially the shape and finishing of the links, is not crisp or refined. 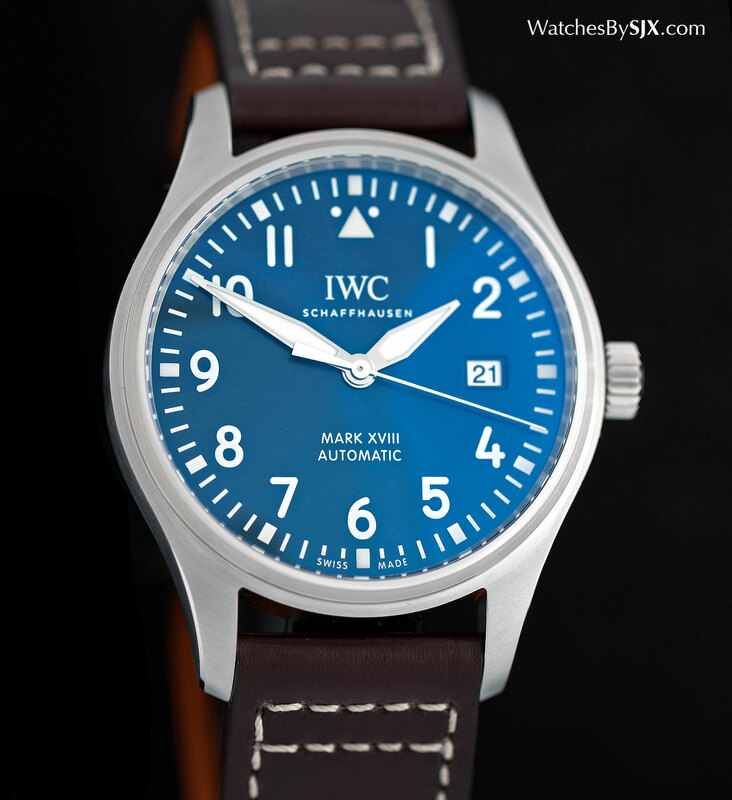 The Mark XVIII “Le Petit Prince” is only available with a calfskin strap, while the Miramar is only sold on an embossed calfskin band that resembles canvas. 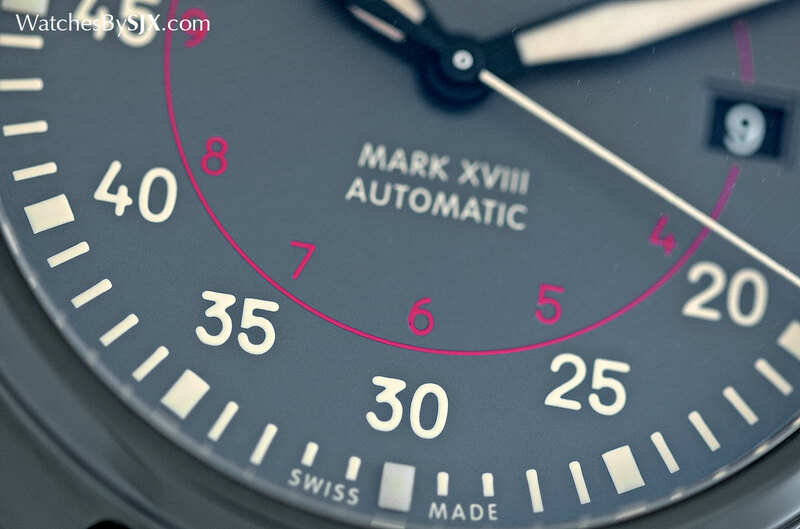 One of the most compelling qualities of the Mark XVIII is its price, US$3950 or S$6250 on a leather strap – US$950 less than the model it replaces. The same with a steel bracelet is US$4950 or S$7650. And the Mark XVIII Miramar will cost US$5400 or S$8350. Correction March 24, 2016: Price for models on leather strap corrected. Correction January 30, 2017: The movement inside the Mark XVIII is the calibre 30110, and not the calibre 35111.